ESPN's pregame show kicks the college football season off in South Bend. 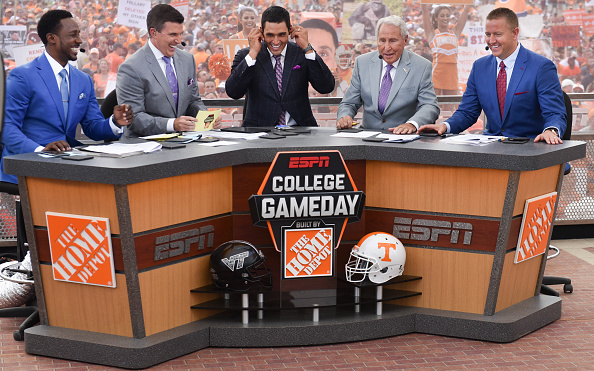 ESPN took College GameDay on the road for the first time in 1993. The location was South Bend, IN, for a showdown between #2 Notre Dame and #1 Florida State. To celebrate 25 years on the road, ESPN returns to South Bend for the 2018 college football season’s first edition of College GameDay on Sept. 1. That’s when the #11 Fighting Irish take on the #14 Michigan Wolverines (the game will be at 7:30 PM ET and shown on NBC). While Michigan-Notre Dame used to be an annual matchup, the two schools haven’t faced each other since 2014, so there’s a lot of hype to renew the rivalry. Rece Davis, Kirk Herbstreit, Lee Corso, Desmond Howard, David Pollack, and Maria Taylor will be on hand at Notre Dame for ESPN’s always entertaining pregame show.